Science, no matter how well designed & executed, can never come close to the astounding capabilities of the human body, mind and spirit. My focus then is using Breakthrough Health Science supported by Cutting Edge Technologies. The revolutionary NES Health System to support the body’s miraculous renewal activity, integrated with Heart Intelligence®, gives Body Wisdom the competitive edge and outstanding advantage of a unique Health and Wellness centre, which you will find nowhere else in South Africa. I believe that if people know and understand better, they will do better and that it is true on the conscious & subconscious levels. You don’t have to be a science guru to understand boring anatomy, but rather a new view that begins with the simple but critical important question, “who am I”? “The body is the true miracle. The body is designed to repair, restore, protect and defend itself if it gets the tools that it was intended to have. Dr Steve Nugent: How to Survive on A Toxic Planet, 2nd edition revised 2004. In our quest for true health care, it is only the foolish & ignorant that still think we do not need cutting edge health care technologies or dietary interventions. 1. Decoding the Human Body Field, The New Science of Information as Medicine --NES Health System for Creating Total Wellness. 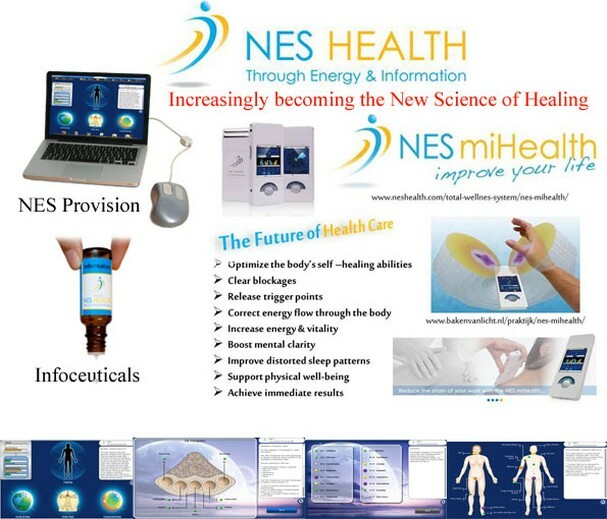 NES Health is based on one core principle - that energy and information control biology. NES Health offers a revolutionary, new approach to evaluating and promoting wellness. Many thousands of people from around the world have reported significant positive changes through NES Health. This new holistic health therapy is based on a ground-breaking theory of the human body-field, the information network that informs the physical body what to do and when to do it with astonishing precision. The human body-field is the structured network of information and energy that underlies the physical body and drives physiology. Included in this information, is information from other aspects of the human body-field that is bio-energetically related to releasing emotional shocks and promoting mental integrity and vitality. Bio-energetics relates to the energy needed to move everything in your body and Bio-information is the information it receives - the information of life. This body scanning software and information as medicine (infoceuticals), give our clients the power to help restore their well-being at the deepest level. The Total WellNES system is designed to read, communicate with, and stimulate a change in the energy of the body. Mapping the human body-field involves discerning intricate webs of relationships. It's about realizing that the body does not find only one correct answer but instead prefers to make the best possible choices under the circumstances. To see how the Total WellNES System of health care helps the body restore health and overall wellness, firstly it helps to understand the nature of the human body-field. Then we will look at how our NES Health Technology works. “At NES Health, we aim to undertake research that fuels scientific revolution and creates real impact for how we view health and how we can approach reclaiming health for every individual. Because our focus is quantum in nature, it is not currently seen as profitable in the marketplace and, therefore, not undertaken by commercial organizations.”……. Why do we choose to use the NES Health System? What is the difference from other devices? Many other bio-technologies rely on detecting distorted frequencies in cells or organs and then sending a corrective signal in the form of sound, light, magnetics and such. But if the human body-field is distorted, then the body cannot hold those corrective frequencies. Eventually, they will become distorted again. Any correction, therefore, is usually short term. The body scanner used by BODY WISDOM™…, is different; we are not trying to dictate to the body, instead, we are working at a deeper level - with the body's master control system, the human body-field. We directly correct the information and energy networks of the human body-field, which in turn helps restore the body's own self-healing capacities. Once the human body-field is corrected, the body knows what to do, when, and how in order to return to its natural state of well-being. The Computerized information, with a scientifically data recording system, has the ability to compare before & after treatment processes, therefore our clients will have the advantage to feel and see how the imbalances are turnaround to a more balanced state. This way they will discover the answers to take back the control of their lives. The human heart emits the strongest electromagnetic field in our body. The heart's electromagnetic field is five thousand times stronger than the brain's electromagnetic field. This electromagnetic field envelops the entire body extending out in all directions, and it can be measured up to several feet outside of the body. Research shows that as we consciously focus on feeling a positive emotion it has a beneficial effect on our own health and well-being, and can have a positive effect on those around us. For centuries, the heart has been considered the source of emotion, courage and wisdom. HeartMath® is a scientifically validated system of techniques and technologies that will help you to transform your stress by helping you to build your resilience and boost your performance. HeartMath® is easy to learn and the simple but powerful techniques can be used “in the moment”. HeartMath® South Africa is dedicated to improving health, performance and well-being at home and in the workplace. We provide products, training and consulting services that build happy and resilient individuals, teams and organizations. If there is one word you should add to your vocabulary today, tomorrow or soon, it is coherence. All the research shows that when you have it, your life can be so much better than when you don’t. Add coherence to your personal lexicon, learn how to achieve it and experience the benefits within yourself and your environment. "Coherence is the state when the heart, mind and emotions are in energetic alignment and cooperation," Institute of HeartMath Research Director Dr. Rollin McCraty says. "It is a state that builds resiliency – personal energy is accumulated, not wasted – leaving more energy to manifest intentions and harmonious outcomes." HeartMath® SA licenced 1:1 coach? HeartMath® South Africa’s unique Coach Training and Group Licensing Programs have been created for coaches, counselors, therapists, consultants, HR, medical and health professionals and others who want to teach their individual clients the HeartMath system through a one to one process or group process. HeartMath®’ s award winning technology is accessible to everyone and very easy to use. Backed by 20 years of research, HeartMath® scientists found the link between resilience, the heart, stress and emotions. 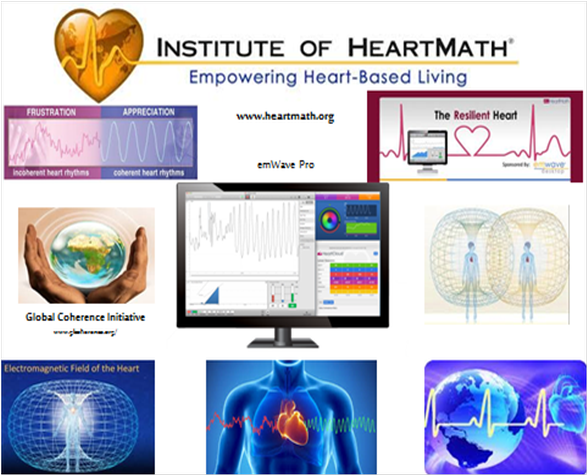 HeartMath®’ s innovative feedback technologies give you real-time insight into your emotional, mental and physical state and help you develop the ability to self-regulate. emWave Professional™ is preferred by many health professionals and coaches.  Immediately lower stress hormones.  Raise anti-ageing DHEA hormone levels naturally.  Improve your heart rate for maximum longevity.  Maintain emotional clarity in the midst of chaos.  Handle stressful situations with ease.  Achieve peak mental and intuitive performance. Transforming Stress into Resilience, using emWave Pro to monitor Heart Rate Variable together with HeartMath® techniques. We work with our clients to develop a tailored program to kick-start their healing journey. We do not diagnose or treat any illnesses or diseases, we determine only imbalances. These imbalances are then addressed with the infoceuticals that have the ability to bring the body back into balance. This balance correction helps to switch on the intelligent self-healing power of the body! If you wish to maintain optimal health and know the facts, you will understand that in the 21st century these cutting edge health care technologies & dietary interventions are no longer luxuries. Your Healing Journey begins when you select Body Wisdom for your first consultation to explore what we really have to offer.